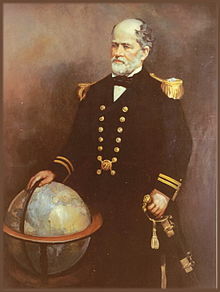 officer in the United States Navy; American oceanographer, astronomer, meteorologist, cartographer, author, geologist, microscopist, scientist, historian, and educator. Physical Geography Of The Sea. 1855. New York: Harper & Brothers. Physical Geography of the Sea and its Meteorology 1864 - 11th edition revised and enlarged. Elementary Geography: Designed for Primary and Intermediate Classes. Published Address of Com. M. F. Maury, before the Fair of the Agricultural & Mechanical Society. For the Philodemic Society at the commencement of Georgetown College on August 28, 1846. Address Before The Literary Societies of the University of Virginia on June 28th, 1855. This page was last edited on 24 June 2018, at 12:57.